Clusters of neurons and their processes in the autonomic nervous system. In the autonomic ganglia, the preganglionic fibers from the central nervous system synapse onto the neurons whose axons are the postganglionic fibers innervating target organs. 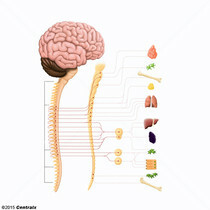 The ganglia also contain intrinsic neurons and supporting cells and preganglionic fibers passing through to other ganglia. Ganglia of the sympathetic nervous system including the paravertebral and the prevertebral ganglia. 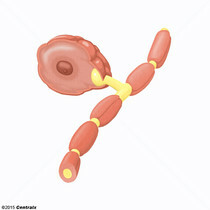 Among these are the sympathetic chain ganglia, the superior, middle, and inferior cervical ganglia, and the aorticorenal, celiac, and stellate ganglia. 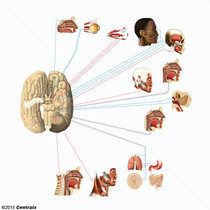 Ganglia of the parasympathetic nervous system, including the ciliary, pterygopalatine, submandibular, and otic ganglia in the cranial region and intrinsic (terminal) ganglia associated with target organs in the thorax and abdomen. Clusters of neurons in the somatic peripheral nervous system which contain the cell bodies of sensory nerve axons. Sensory ganglia may also have intrinsic interneurons and non-neuronal supporting cells. The semilunar-shaped ganglion containing the cells of origin of most of the sensory fibers of the trigeminal nerve. 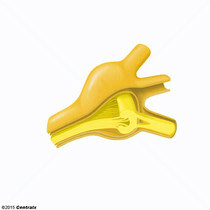 It is situated within the dural cleft on the cerebral surface of the petrous portion of the temporal bone and gives off the ophthalmic, maxillary, and part of the mandibular nerves. The non-neuronal cells that surround the neuronal cell bodies of the GANGLIA. They are distinguished from the perineuronal satellite oligodendrocytes (OLIGODENDROGLIA) found in the central nervous system.